Olivier Assayas’ ambitious five-and-a-half hour biopic Carlos (2010) is obsessed with movement. For one, it attempts to chronicle at length the activities and philosophy of those radical counterculture movements of Europe in the 60s and the 70s. It is also keen on charting the movement of history in relation to its central figure – an aspect that is perhaps the most fundamental part of the film’s text. Then there is its endless preoccupation with physical movement: of people and of goods. Some commentators might point out that Carlos plays out as a good history lesson. Actually, it makes for a better geography course. From South America to Europe, from Africa to Asia, Carlos is always on the move. One could say that, like the shark, he will perish the moment he stops moving. (In this respect, the picture’s last line, after Carlos is captured by French feds, is terribly befitting). He is almost entirely defined by his location and his political orientation at any given point in time can be deduced if the country he lives in is known, which is why Assayas’ film is as much a travelogue as it is a biography. For Carlos, men are no different from the countries they represent – a mentality that eventually turns against him for good. Carlos is always on the move too, with its syntax infested with zooms, pans, tilts and dollies, as though it’s breathlessly trying to catch up with its subject. That’s why the film’s most telling shot is almost purely photographic: a very gradual zoom-out shot of a plane standing still at the Tripoli airport after it has been denied permission to land. Following the juggernaut that the film hitherto was, this decidedly incongruent shot leaves the viewer gasping for air. This is probably how Carlos feels at that moment as well, for he stands on the brink of a massive failure. Till this point, the film’s heady trajectory and Carlos’ cardiograph would have looked exactly the same. Now, all this talk about Carlos in the present tense might sound nonsensical given that the real Carlos is an old man serving life sentence in northeastern France. But one must also keep in mind that Assayas’ Carlos is purely a fictional character built upon the filmmaker’s vision and based only partially on the real Ilich Ramirez Sanchez, as is noted in a clear-worded disclaimer flashed at the beginning of each of the three segments of the movie. This deviation is what saves the film from becoming an insipid reportage like The Baader-Meinhof Complex (2009), another genre film that tried to tap into the zeitgeist of the age. (In fact, the first section of Assayas’ film is no better than Edel’s, with the director spending hours together reconstructing what could have been dispensed with an intertitle or a newsreel; but narrative telescoping is not even remotely a part of the agenda). 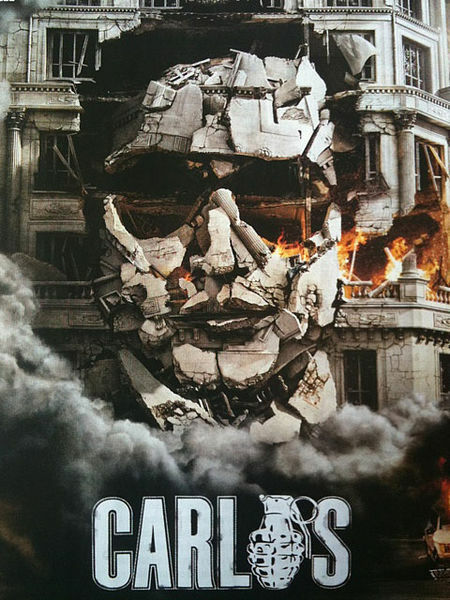 Shot on 35 mm (although I bet at least a few shots were done on video) and spanning about 25 years, Carlos religiously charts the rise and fall of the eponymous terrorist/revolutionary, played by fellow Venezuelan Edgar Ramirez, in a surprisingly straightforward fashion. Painstaking production design that pays attention to period, geographical and cultural details – no mean job for a picture that spans numerous years and countries – and a nearly-anachronistic soundtrack which is almost always used in contrast to the imagery mark the major deviations from the genre. And Assayas’ camera is more than willing to parade these details, in addition to Ramirez’s seemingly malleable physique, and the result is a film with myriad empty, connecting shots. To a large extent, Assayas’ film views Carlos as a chronic narcissistic turned on by weapons and women. “Weapons are an extension of my body” he tells a woman before thrusting a grenade under her skirt. He caresses firearms as if they were his lovers and kicks around women as though they were his handguns. Throughout, Carlos’ physical prowess and virility are equated with his military power. Scenes depicting his military exploits are interspersed with his conquests in bed. His political career in the film is bracketed by shots of him standing stark naked in front of a mirror and admiring well-built body and him lying on a stretcher clutching his private parts under the paunch. All this sounds awfully contrived on paper, but the fact that Assayas derives these metaphors from undisputed biographical details helps turn such tepid arthouse tricks into a clever piece of artistry. However, all this is made evident an hour into the film and Carlos remains more or less an unchanging protagonist for the rest of the film. Like Sorkin’s Mark Zuckerberg, Carlos is the fixed centre of the film around which the universe rearranges itself, in turn redefining and reshaping him. (In retrospect, the last line of Fincher’s film describes him to a T). Does he hypocritically change sides despite his apparently unchanging cause or is it the volatile course of events that have remapped his loyalties? Is the world too dynamic for an old timer like him to catch up or is he a mere mercenary – a selfish, two-bit petit-bourgeois, as his friend puts it – afraid of death? It is probably the latter, although he would like to think not. Curtained and distorted by wisps of cigarette smoke, Carlos is an amorphous figure, with ever changing identities, loyalties and worldviews, and a master of disguises (like Assayas himself, who seems to be hopping genres and feeding on them). Like your typical movie star, he appears to be always conscious of what he’s wearing and not half as much about what he is speaking or doing. As a matter of fact, the film illustrates, he is more a performer than a revolutionary or a terrorist. Throughout, Carlos revels in theatricality. Like Edgar Ramirez, he is a polyglot and before one thinks that he might not know a particular language, he delights himself with a mini-performance delivered in that very language. Fifteen minutes into the film, in its first explosive conversation, we get a sneak peek into the five-hour play that is to come. Carlos’ friend points out to him that he is only craving for applause. He tells her, “You’ll be hearing my name a lot”, and asks her to look at him when he’s talking. During the OPEC raid, he models himself after Che Guevara, complete with the beard and the beret (an actor playing a half-actor-half-revolutionary playing a revolutionary), and introduces himself as “My name is Carlos. You may have heard of me”. The conference room itself resembles a theatre, where he directs his seated audience-actors and performs before them from the end of the hall, Elsewhere, regularly, he shouts, he throws tantrums and he flips, occasionally spouting hyperbole without apparently understanding them a la actor extraordinaire Jules Winnfield. “Without newspapers you don’t exist”, says one interviewer to him – a day before he finds a bullet in his medulla – winning a half-affirmative smile from Carlos. And why not? It is, after all, of his doing. He is the writer, director, the actor and the PR man of his life. He is, also, his own audience. Carlos lives outside himself. If his inner life comes across as something enigmatic to us in the film, it must be the same to him as well. Assayas does not push hard on the psychological front and is concerned more with the “what” of the story than the speculative “why”. It is not a human character, but the totality of events involving Carlos that is the hero of his film. He does not try to delve into the psyche of the man, or some such thing, to make his point. Instead, he lets Carlos’ actions reveal how self-contradictory a person he is. (Ramirez’s non-Method portrayal itself comes across as all surface and no center, as if he’s playing a mummy that’s been totally hollowed out) One might wonder whether he really believes in all those flowery platitudes that he mouths off now and then. (After all, he respects the truth value of clichés). It doesn’t really matter, suggests Assayas’ film, for his actions turn out to be far removed from the directives of these rhetorical remarks. He announces that he is a man of peace and that he loves life while he is more than happy to lodge an extra bullet or two into a man who only tried to resist him. He tells the interviewer that he studied dialectics in Moscow but also insists that no one tell him what to do. He speaks to the Saudi Arabian oil minister in fatalistic terms while, elsewhere, he comments that he is entirely responsible for his men. Possibly the greatest irony that marks Carlos’ life, which one federal agent notes towards that end, is that, for all his anti-capitalistic, anti-American baloney, he really had no criminal records against America. In fact, this whole enterprise that Carlos sets up and develops is more symptomatic of corporate capitalism than anti-capitalistic revolution. Missions are throttled and determined by the inflowing funds rather than their agenda. A delayed assassination plan allows for competition to seal the deal. We witness countries nourishing anti-state organizations for political gains in the exact manner that corporations fund parties for fiscal benefits. The world is a market and revolution, a business. Pretty much like modern economics, Carlos illustrates how the numerous political maneuvers in different parts of the world are linked intricately to each other and often in contradicting ways (which reminds one of Godard’s observation regarding Jews, Hollywood, cinema halls and Mecca in his last). The film, itself, is directed and edited like a corporate thriller full of roundtable discussions and cutthroat business strategies. Moreover, Carlos is ostensibly a “gangster movie” as well, with its detailed account of the rise of an underdog, his notoriety and his disgraceful fall (in addition to its multiple nods to The Godfather (1972)). But then, there’s only a little difference between the two genres anyway. Mike Wayne notes in his book Political Film: The Dialectics of Third Cinema that the gangster figure – a man who steals from the rich and keeps it for himself – in popular cinema is emblematic of the dark side of capitalism while the bandit – the Robin Hood variant – represents a subversive if temporary threat to the same system. One could take this further and observe that the revolutionary goes one better than the bandit in that he is interested in not merely providing temporary monetary relief for the poor, but in toppling the establishment that creates a need for bandits. The tragedy about Carlos (and many of his cohorts) is that he fails to recognize if he is being the revolutionary that he wants, an ineffective bandit out of touch with the masses or a parasitic gangster running a reign of terror. Placing Carlos’ example in a broader context, Assayas’ film makes a strong if not the ideal case against armed struggle. It probes, as does Bellocchio’s masterful Vincere (2009) (although Assayas’ ideological investment is relatively insubstantial), into a hermetic passage in history and opens it up for present day-analysis. Like Edel’s film, but with a far more focus and detachment, Carlos examines how an armed movement with an urgent, uncompromising objective is bound to foster authoritarianism and how a revolution is deemed to go against itself when its operative hierarchy branches out from a single spearhead – the father, if you will. Make no mistake, whatever organizations Carlos was associated with, they were, thanks to their pigheaded adherence to a shallow and monolithic view of the world, undemocratic (“soldiers must fear their leader” goes the rule of thumb), racist (anti-Zionism easily mutates into anti-Semitism), sexist (especially when radicalism is uncritically married to certain religions, one of which Carlos is reportedly a proponent of), imperial (a pro-Palestine stance, it seems, reads as an anti-Kurdish one), bourgeois (by forming a bohemian clique far removed from the lumpenproletariat, the group it pretends to champion) and downright fascist. All these symptoms are even more relevant in the post-9/11 world where the resistance to occupation has translated into such a blanket rejection of western traditions that movements often lose sight of what is genuinely progressive and what is not. Ha! I hadn’t thought ofthis JAFB, but it’s certainly vivid enough. I don’t know what to say here, except that I’m speechless. This has immediately been named by me to The Seventh Art Hall of Fame, and is further evidence of your astonishing skills as a writer and observer. And yes, VINCERE is masterful, and very happy to see an opinion on it. I seem to like CARLOS a bit more than you do -for me it contends for film of the year with three other French films at this point (LOURDES, UN PROPHETE and WHITE MATERIAL)but I think your commanding piece was complimentary enough. Thank you, Sam. Yes, I do realize that CARLOS has made it to your top 10 already! And your tete-a-tete with Assayas himself is like the cherry on top. You do mention there that the cuts were dstributed equally instead of chucking out a whole section. That good to hear, Sam, because I do think the theatrical cut could make for a better picture since there’s a lot of scope for pruning here, IMO. But then, the film’s also heavily biased against Carlos. the length actually mitigates that bias to some extent. Any distillation might also prove to be very one-dimensional. Anyway, I think I’ll see the theatrical cut as well. And, as I have just linked your review to his, JAFB, I will now link Jake Cole’s CARLOS review to yours! Thanks for the plug, Sam. Jake’s review is a mighty one, in scope and length. Wonder how he pulls this off, every time. Whilst watching Carlos I couldn’t help wondering if director Assayas was making deliberate parallels with another contemporary revolutionary figure of ambiguity and disdain – Osama Bin Laden? i personally think carlos and badder meinhoff….will never hold up to the tongue and cheek of third generation and ecstasy of angels.